When challenged by a friend to come up with a pimp of worth proportions I had to delve deep into my childhood to find something magical, edible and super-sized. And lo…….my mind flickered towards the Baked Bean Castles I made with my sausage, mash and beans as a child (and maybe, from time to time, still). Savoury – yes! But, like, big! The snack recipe has a simplicity that would make Sloth from The Goonies blush! 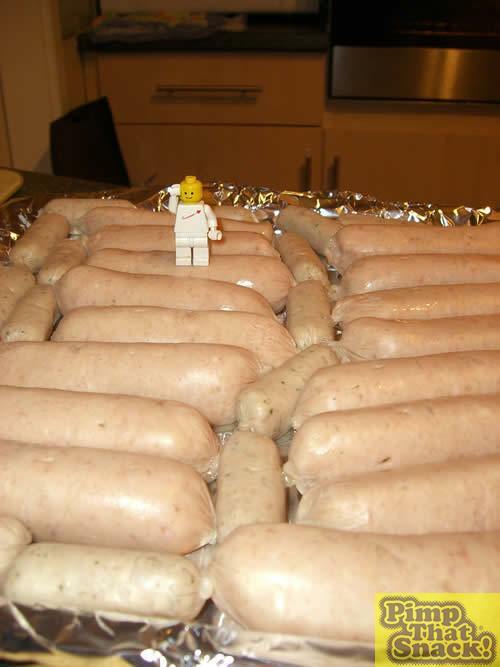 To begin the 36 sausages were carefully placed on a baking tray and pricked to avoid a meat disaster! Next 5 kgs of potatoes were peeled. Joy? No. Hell on Earth. 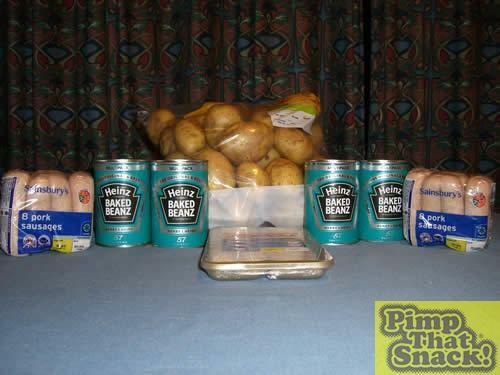 However, my mood lifted on completing the task……the sight of 5kgs of peeled potatoes is a truly beautiful thing. 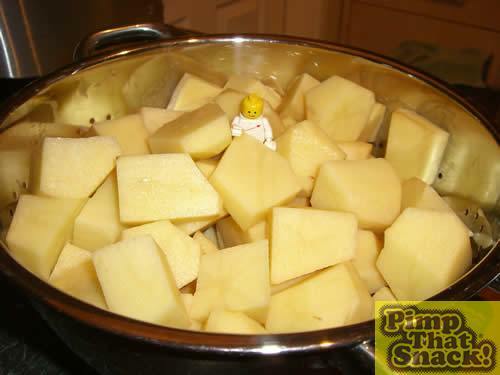 The potatoes were placed in boiling water to soften them and make ready for mashing. Meanwhile, in the vicinity of the oven……the sausages cooked. 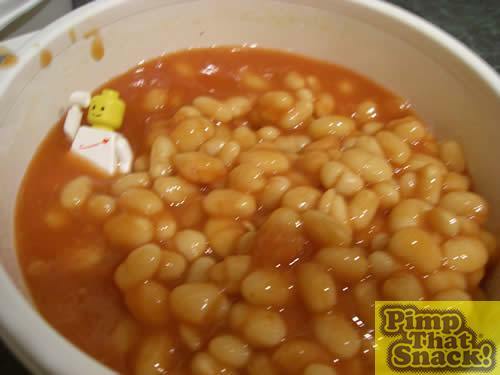 To ease the pressure on the hobs the Baked beans were moved into microwave-proof Tupperware ready to be nuked. Toby, the kidder, did some laps. 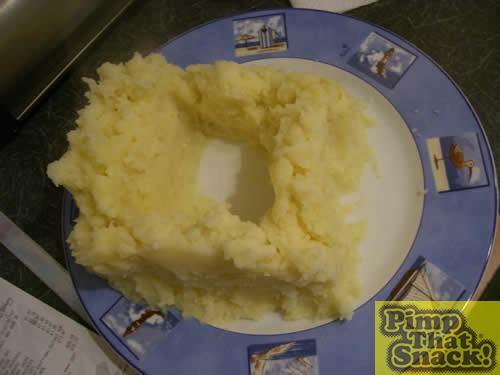 In no time the potatoes were ready to be mashed! In the distance the sausages continued to cook…. 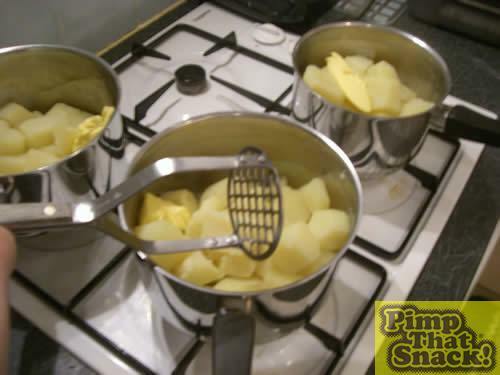 In the time-honoured tradition, the potatoes were mashed with a potato masher. Milk, fake butter and salt were added to the mix. The walls of the castle were then crafted from the mash.